Cast Iron Fry Pot Set Complete your outdoor and home kitchen by expanding your menu with this cast iron pot set. Fry your favourite wings or create a delicious seafood boil anytime, inside or out. This pot set includes a 7.5 quart cast iron pot, lid, and handled basket making if perfect for French fries, stews, steamed vegetables, seafood and more. The pot comes preseasoned with Camp Chef's True Seasoned Finish making it ready to cook on out of the box. Cast Iron Fry Pot Set is rated 5.0 out of 5 by 3. Rated 5 out of 5 by MonstrariDigito from Great deep frying. I like this deep fryer. Tested it out at home, on the stove, frying up potato crowns, french fries, tater tots, bread crumb breaded pacific cod, and panko breaded coconut shrimp. Used a Camp Chef 6" Deep Fry Thermometer to see how hot the oil gets, and yes! The red on the gauge indicates that the oil is hot enough to catch on fire! So be careful. With the stove on high, the frozen potatoes deep fry until slightly golden, around 300°- 350°. Potatoes should be fried first, to keep from absorbing the fish taste. The thawed panko and coconut breaded jumbo shrimp, takes medium heat, and deep fry very quickly, minutes, until the tails turn from grey to pink. The thawed and breaded pacific cod took longer than the shrimp. The cod was tricky though, because the breading wanted to brown long before the fish was cooked throughout. The cod took rotating heat between hi and med, until light brown on the outside, and cooked in the middle. The cod literally melted in the mouth. The oil had to be thown away after deep frying the fish. This will certainly be a challenge to use over campfire coals! Unless you're a chef, I recommend testing this fryer out at home, in the kitchen, before using it camping, or on a grill. Rated 5 out of 5 by Rex from Great for making french fries We bought this unit to use as an accessory on our Explorer 2X stove. 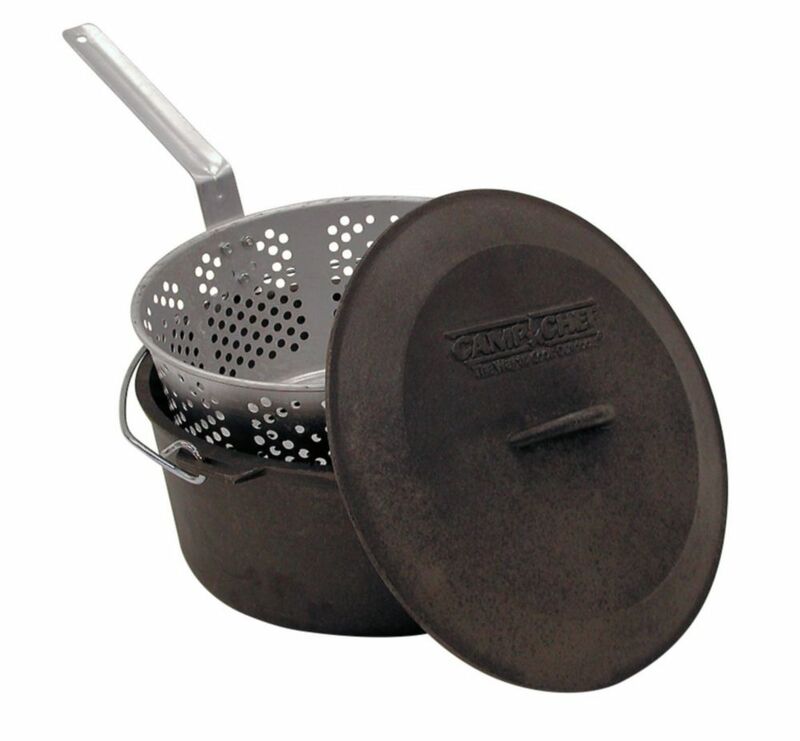 The cast iron pot, lid and aluminum basket are durable and worth the investment. We have made several batches of french fries and are very satisfied with the results.